Yogi turns 87 Saturday and in his honor, the DeKalb Chess Club will be hosting the "It Ain't Over 'Til It's Over" Open, a four-round chess extravaganza. Registration will be conducted from 8:30am - 9:00am at the First Congregational Church in DeKalb. 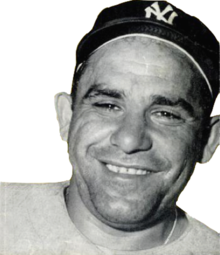 Berra, from the St. Louis area originally, played for the beloved New York Yankees and, according to pundit Bill James, is the greatest catcher of all-time. He went on to coach and manage as well, and in one capacity or another, appeared in 21 World Series. Not bad for an 8th grade drop out! Yogi was prone to utter frequent malapropism, and while "It Ain't Over" may be his most famous, he also once reminded us: "I really didn't say everything I said." While Yogi's quip may have have been uttered with the diamond in mind, its applicability to the 64-square battlefield is equally apropos. What chess player hasn't dropped a piece early in a game, or found oneself in a dire position, only to utter subconsciously, "It Ain't Over 'Til It's Over!" Many a comeback have ridden the coattails of that fine phrase. The perfect mantra for a chess devotee, it's about time someone named a tournament after those six contracted words! Saturday's event will serve as a wonderful warm-up for the 2012 Chicago Open. Players can get in four games with lengthy time controls, G/60 plus a 5 second delay. Although the event will be USCF-rated, these results will not impact the seeding people receive for the Open. Anticipated round times are 9:10a, 11:25a, 1:45p and 4:00pm. We should wrap up by 6:30 so that folks can enjoy a local theater production or drive home while there is still daylight. Sections will be developed at the Tournament Director's discretion, but generally we try to have an Open Section, an Under 1600 section and an Under 1200 section. But you don't necessarily have to win the section to be eligible for cash prizes. In the U1600, a Class D prize is typically awarded for player rated 1399-1200. In the Open section, a Class B prize is usually awarded for players rated 1799-1600. We need to have at least three players qualifying for a award for that prize to be active. So generally, after registration, the TD posts the particulars. As of last tournament, we've added upset prizes for each section... in order to give everyone a chance for some recognition even if they're unlikely to partake of the bigger prizes. Again, the size of the prize funds depends upon registrations received. At least 2/3's of the entry fees received are distributed as prizes, and generally it approaches 80%. The DeKalb Chess Club prides itself on providing quality conditions for its tournaments and we're lucky to be able to enjoy the comfortable surroundings of the First Congregational Church. Players should be aware that there is a Mother's Day plant sale fundraiser going on that day so there may be some occasional noise coming from the kitchen area around the lunch time. If you are prone to distraction, you're welcome to employ an audio device with some soothing music, ocean waves, or rain falling in the forest (always worked for me when I was studying!). Pre-registration discount is activated by sending your name and USCF ID to registration@DeKalbChess.com. Pre-registration cut off is 6am Saturday, 5/12, but it's only a few bucks more without the advanced notice. In honor of the Rockford Chess Challenge occurring to the northwest, there will be no junior event this time around. Juniors are encouraged to play the Challenge, details at RockfordChess.org. Whether or not you're playing in the Open or are a die-hard Yankee fan, come out and enjoy Yogi's birthday and four rounds of great chess this Saturday. And don't forget to take home a plant or two for mother in honor of her big day Sunday!